TruckAccessoriesGuru offers great accessories for your vehicle and great tools that keep you on the road. From emergency jump start systems to 12 Volt Rechargeable Roadside Emergency System is switchable to a 12 volt cigarette power port. Self contained heavy duty jumper/booster cables. 260 P.S.I air compressor with 12" air hose. Led Battery Level indicator. Supplies power to your 12 accessories for hours. Maintain your on board 12 volt systems when servicing your vehicle. 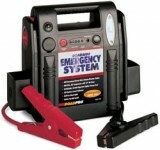 The 12 Volt Rechargeable Roadside Emergency System has a safety on/off swith and built in work light. LED battery level indicator.